DETROIT (Bloomberg) -- Ford Motor Co., returning to the U.S. minivan market after at least a four-year absence, will count on a compact people mover it developed in Europe to drive sales to the children of the American Baby Boom generation. Ford, debuting the C-Max at next month's Detroit auto show, is hoping to lure young families with fuel economy it says is the best of any minivan and a price starting below $27,220. The U.S. will add 11 million new households in the next decade, helping boost minivan sales 52 percent by 2012, J.D. Power said. 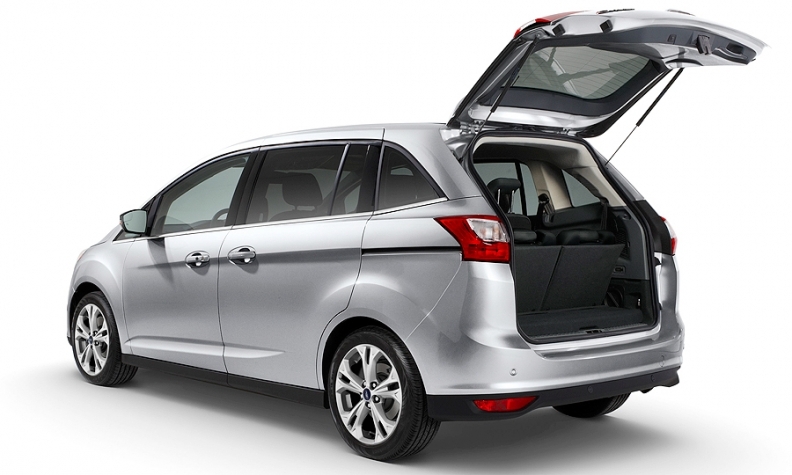 While the C-Max van is based on Ford's Focus small car, it has sliding rear doors and seven seats typical of minivans. The second-largest U.S. automaker said last year that the C-Max will go on sale domestically in late 2011. The introduction has been delayed until 2012, Schuster said. The C-Max has the attributes of a traditional minivan, “without looking like a box on wheels,” said Derrick Kuzak, Ford's product development chief. Ford will build 10 models, including the C-Max, on the mechanical foundation of the Focus, Kuzak said. Ford abandoned the minivan market in 2006, when it ended production of its Freestar model. Ford sold 46,245 Windstar and Freestar minivans that year, while Chrysler LLC sold 211,140 Dodge Caravans and Honda Motor Co. sold 177,919 Odyssey models. In 2008, Ford went after the people-mover market with the boxy Flex model, which didn't achieve the automaker's sales goals, Schuster said. Ford sold 38,717 Flex models last year. The U.S. minivan market peaked at 1.4 million vehicles in 2000 and fell 70 percent to 415,173 last year, according to researcher Autodata Corp. of Woodcliff Lake, N.J. J.D. Power forecast the U.S. minivan market will grow to 630,857 vehicles in 2012 as the economy recovers and the offspring of the baby-boomer generation begin having families, Schuster said. Ford now sees an opportunity in selling a compact minivan that is less than 15 feet long to the boomers' children, who are interested in good fuel economy and a model with “a tidy overall footprint,” Kuzak said. The C-Max is two feet shorter the Honda Odyssey and the Dodge Grand Caravan, which each are about 16 feet, 11 inches long. “That very efficient size and price-point, we believe, is well-suited to the needs of young families looking for fuel- efficient alternatives,” Kuzak said. Ford may sell as many as 50,000 C-Max models annually in the U.S., Schuster said. That would be more than twice the sales of Mazda Motor Corp.'s Mazda5 model, which sold 18,488 last year, making it the top-selling compact minivan in the U.S. The C-Max will have better fuel economy than the Mazda5, which gets 21 miles per gallon in city driving and 28 mpg on the highway, said Said Deep, a Ford spokesman, who declined to give a specific figure. It will be priced between the Focus sedan, which starts at $16,640, and the Edge crossover, which starts at $27,220, Deep said. The 7-seat model, known in Europe as the Grand C-Max, went on sale in Germany, France and the Netherlands over the last six weeks and sales data aren't yet available, according to Astrid Wagner, a company spokeswoman. A 5-seat version called the C-Max went on sale in Europe last month and Ford sold about 4,600 models, Wagner said. To create cargo space in the U.S. version of the C-Max, the middle seat of the second row can be folded under the right-hand seat, Ford said. The second-row seats also slide and recline. Ford will debut a “hands-free liftgate” on the C-Max, which enables the driver to open the back hatch with a kicking motion beneath the rear bumper. That motion triggers two sensors embedded in the rear bumper that set off the automatic tailgate. The driver must be carrying the key fob to engage the sensors. “The C-Max will be the first application of this technology, but stayed tuned, there's more to come,” Frank David, vice president of product develop for Ford of Europe, told reporters Dec. 14. The combination of new features, low price and high mileage may enable Ford to succeed in the minivan market this time, Schuster said.